Sengoku Mahjong (戦国麻雀, Sengoku Mahjong?) is a mahjong game developed and published by Hudson Soft for the PC Engine in 1988. Sengoku Mahjong is set during the Warring States period of Japan, a tumultuous time when various warlords competed to rule the country. In this game, they do so by conquering their rivals at Mahjong. As with most other Mahjong simulators, this is an accurate portrayal of the classic Chinese board game, complete with detailed tiles and animated character portraits. It is four player, though two players are obscured by the sides of the screen (the player can move the camera to see their tile walls, but not the tiles themselves). As per usual Mahjong rules, the first player to put together a winning hand - either from the tiles they collect at the start of each turn or the discarded tiles of other players - wins the game. 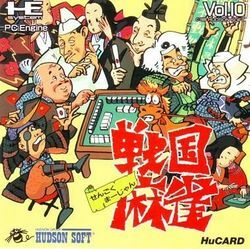 Though a Mahjong game set during the Warring States period was nothing new at the time, Sengoku Mahjong has the honor of being the first Mahjong game made for the PC Engine. As might be expected, it was never released outside of Japan. It was, however, rereleased on both the Wii Virtual Console and PSN, in 2007 and 2009 respectively. This page was last edited on 13 May 2016, at 20:39.